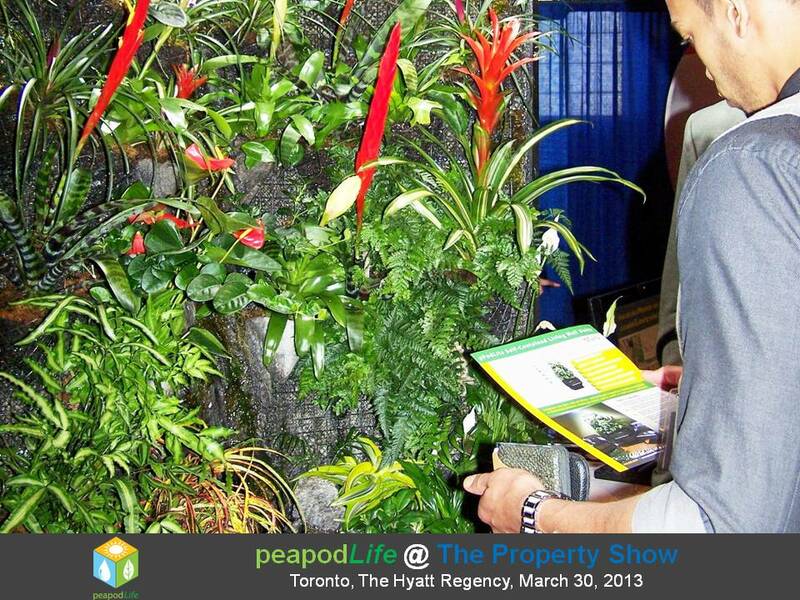 The PeapodLife team was in force at the complete with a pPodLite self-contained ecosystem on-hand for architects, investors, developers, interior designers, and more to experience up-close and personal. “Gorgeous!” Many attendees also marveled at the wonderful assortment of rainforest flora and fauna, including bromeliads courtesy of Valleyview Gardens, orchids and even moss. The waterfall provided soothing sounds and aquatic plants and fish from Menagerie Pet Shop rounded out all the stunning elements of natural beauty. PeapodLife Project Director, Attila Lendvai, gave a 45-minute presentation “How to Add More Green to Your Portfolio.” His talk highlighted the opportunities for real estate investors, particularly condo developers, to increase the value of their property portfolios with the help of PeapodLife. Some of the value-added benefits for property include the cleanest freshest air, living water and most organic local food imaginable. 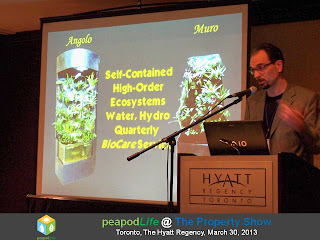 All this, thanks to the ecosystem, designed and built by PeapodLife's Strategic Partner Genetron Systems. “I can really feel it!” That was the universal response felt by all those who experienced the ecosystem in the flesh. 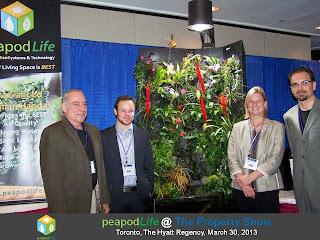 The clean fresh air radiating off the pPodLite unit could be felt vividly within a few feet of the ecosystem. We explained that while the convention space was too large and open for one pPodLite to freshen up, it would take only a few hours for it to fill a smaller space like condo, small home, living room, rec room, etc. with fresh, clean air. “The photos are nice, but they really don’t do the ecosystem justice.” Many commented on the difference they felt compared to the rest of the hotel convention rooms, and the impact pPodLite had on them after having experienced it firsthand could not be overstated. “You know where they need one of these…?” Was another common response. We had people from all walks of life telling us the positive effect they could feel would be perfect for hospitals, health spas, centers for kids with special needs, and so much more. All in all, it was a wonderful day for all of us here at PeapodLife. 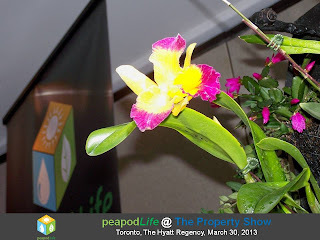 We met a lot of truly great people, each as vibrant and unique as the orchids leaping from the pPodLite ecosystem. PeapodLife would like to acknowledge pPodLite Show Sponsors Valleyview Gardens and Menagerie Pet Shop who are Strategic Partners and suppliers of PeapodLife Advanced Human Habitat. We would also like to thank Kelly and Robert from The Property Show for their fine planning and labours to ensure our 2013 Property Show was the BEST (Building EcoSystems & Technology)!